They are again made following the excellent pattern in Bend The Rules Sewing. The fabric is craft cotton from Spotlight, except for the navy gingham which I picked up at a thrift store. They are all backed with white flannel. I love this pattern. The method of construction is really simple and they sew up really fast. I think I completed these in about an hour. Alas I am not particularly welcome at the Spotlight branch in town or I'd get some of that cute spotty stuff for sure. 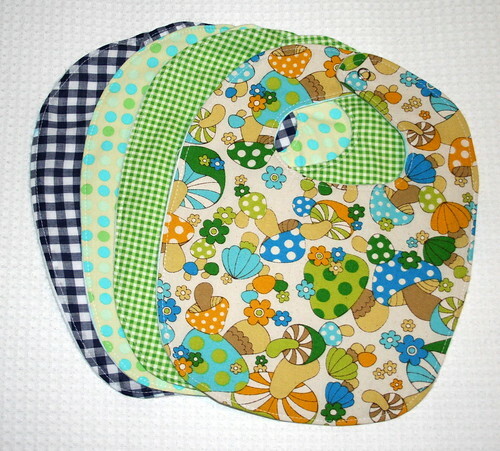 The mushroom fabric is so cute and retro. I love this fabric! Those bibs will make the little one a hip little baby. and I like that the fabric you used is gender neutral.... I am sure the parents are up to their eye balls in pink or blue. So sweet. I love the little mushroom fabric.